So yesterday was kind of one of those days. First of all, it was a Monday, which is never good for anyone. Second, because Thanksgiving is next week, my kids have a short school week, which means that on Thursday morning, we are leaving the first real family vacation (like where we’re not shoehorned into someone’s spare bedroom/couch) we’ve taken in 6 1/2 years (so pretty much my kids’ whole lives). As excited as we are to go, there is so much that needs to be done before we go. I need to make sure y’all and all your Thanksgiving needs are taken care of, my dog swiped my toast this morning while I wasn’t watching and then decided to un-house-train herself, my house is a disaster, my children didn’t go to bed until 9:30 last night because we were watching the last Harry Potter movie, meaning this morning, my daughter had the horrible realization that she couldn’t eat her breakfast because she didn’t like the length of her pants. (please excuse her less-than-model-perfect hair–again, one of those days. Also, I’m not a neglectful mother, it really is warm enough outside for tank tops and shoelessness). As much as I was trying to hurry things along, she reaaaaally wanted to help measure and pour. I was stressing out. I may have kind of yelled. See that dusty mess on the table? Imagine that all over my house. Then we picked up my little boy from the bus stop. And he had had a really bad day. By the time we had settled the fact that math isn’t the biggest deal in the world, we had time for cookies, but I knew it was going to be stressful and I really wanted to not be mad and yell-y while we were doing it. Enter…refrigerated cookie dough. Believe me, when the cookies matter, I’m a 100% believer in homemade cookie dough. But when memories and quality time matter and time’s short? Refrigerated cookie dough all the way, baby. See where we’re going with this? Pizzookies, anyone? 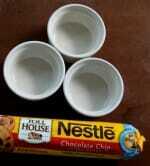 Disclaimer: Nestle provided me with chocolate chips and cookie dough, but the opinions and memories are all miiiiine. So sorry to hear you had one of THOSE mornings! I can totally relate;). LOVE the cookie dough dessert! YUMMY! I will have to make that very soon. THX! Have a wonderful vaca! I’ve always told my husband that men and women have total different perceptions of vacation. Before…after…and even DURING is SO. MUCH. WORK!! I hope you take a vacation from vacation when you get home!! I’ve determined vacations are only vacations when the kids aren’t there!! 😉 Love them, but love a break! Having been there-done that, I can guarantee that years from now you will not remember the pretzel dust or messy house and neither will the kids; but none of you will ever forget the memories you make. While it is a little cliche’ all you really get to keep is the memories you make. Someday, when you see your kids doing these things with their kids, you will see what it is that really has an impact on them. Time goes by quickly – savor it! I seriously love this post because it makes me feel better that I get frustrated in the kitchen with my kids too. They love to help me, but they’re only 3 and 21 months. Sometimes I just don’t have the patience for it, but I LOVE them helping me most of the time. Wait. What were you doing with the pretzels? Yes, I baked cookies with my 4-year-old yesterday. I had to keep repeating in my head, “Keep this FUN and relax” as she wanted to measure everything. So…making cookies took basically FOREVER, but she loved it. I managed to relax, but yes–a lot of cleaning up afterwards! We nearly made Pizzookies last night, but decided that eating the caramel apples we’d made that afternoon was dessert enough (we’ve made the apples four times since Sara posted them last month…can’t get enough!). Have a blast with Mickey and friends! This makes me feel better. Instead og making sugar cookies from scratch or ginger bread cookies like I did two years ago with 4 kiddos, I’ll do this with my six I have now and my five month pregnant body. I want to make memories but want it to be perfect and I just can’t do it! Refrigerator cookie dough is just what I need. Thank you for making me to feel less guilt!!!!! And I had to laugh when you said to forgive the not-a-model hair style…she looks like a happy kid, that’s about as model-y as a child should be!! And I work at a daycare…if one 3 year old is hard enough to cook with, try 12!! You come up with A LOT of little jobs haha!! I love your post…we all have bad days and we can make them better. I love that you aren’t afraid to share your bad days (oh, and that you yell occasionally! ), it just makes you that much more relatable. Thanks! Since we never eat a whole batch of cookies ourselves, I always freeze about half the dough. 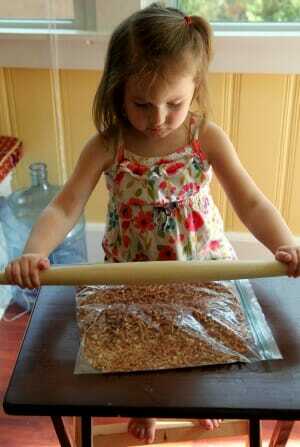 Perfect for the quick times when a tube of refrigerated dough would be handy. Enjoy your trip! What great pics! Love your sunny yellow kitchen, your adorable barefoot daughter, and your sweet son, whose haircut makes him look like a nice young man! You’re a good Mom…..the smiles on your kids faces prove it! When your little girl is getting married – I hope you will use these pictures and make a favorite recipes from home scrapbook! You mean you have days that are better than hair-is-passable and house-is-a-disaster? That’s like, every day for me. The Saturday that we get around to cleaning the kitchen floor is a once a semester deal, just about. You are awesome! Have a great vacay. You deserve it, clearly! Made me wish I could have been there to help you! Yeah, this is why I’ve decided it’s unrealistic to want more than the one kid I’ve got. She’s not even 2 and has such strong opinions that I can’t imagine how much worse it’s going to get. I’m a firm believer in letting the helpers help even though it will take 3 times the time you can do it. 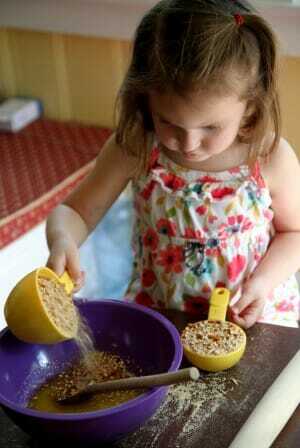 remember it’s your love of cooking you’re teaching. The kids will remember Yes even teens. I love that you a human and have some of the same frustrations that can turn into a learning to love it moments! 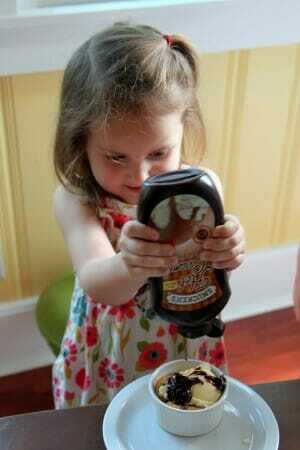 I am going to have to try this with my little helper. You are awesome! You have singlehandedly removed the guilt from the roll of refrigerated cookie dough and replaced it with joy and fun. Your words and actions have put smiles on the faces of two cute kids. And all of this from a cooking blog? It don’t git inny bettern’ this! My most favorite thing about you and Sara are how human you are! I love hearing about whatever life brings you and how you make it through. You brighten my day with laughter and joy plus amazing recipes and food. Thanks for being human and not lying that every day is perfect day with you and your kids and always having a clean house. You and Sara are amazing! 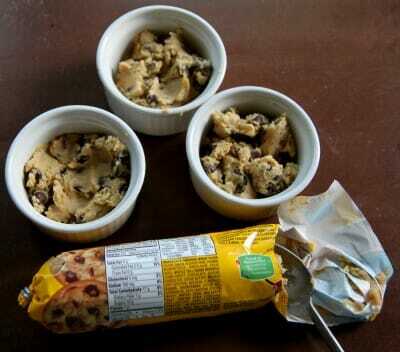 Wow I’ve never seen cookie dough baked like that before- what a great idea! How long does it usually take to cook? 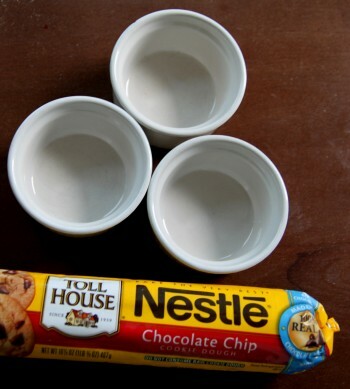 It may only be 7:25 in the morning here… but I still want to make those cookies! “my daughter had the horrible realization that she couldn’t eat her breakfast because she didn’t like the length of her pants” is my favorite sentence. ever. Is she 3? I think she would be such good friends with my 3yo who can’t have her hair brushed because we can’ find her book. Gotta love the mind of a 3-year-old girl! You don’t have to apologize for your daughter’s hair! It just means you’re human and we all like to know that. 🙂 And I love that you try so hard to make cooking time fun for the kids. Sometimes I’m good at that and sometimes, not so much. I get all annoyed about spills or the extra time it’s taking, etc. And now we know what the pretzels and butter were for, regardless of whether or not you posted multiple pictures of said ingredients. Glad you let Mer help after all! ❮ Previous Post Previous post: Smucker’s Trip Recap + Giveaway!